Maybe you found them at pet events this past spring or summer, at Doggie Dash in May, or Dogtoberfest in September, Or perhaps you’ve passed their display on the aisles at Whole Foods in Portland’s Pearl District. They are Waggin Tails Organic Dog Biscuits — little brown bags of tasty goodness — created and packaged by Port City (PC). Gifts abound at Port City, but like everywhere these days, budgets are tight, and PC has had to adjust. A significant portion of its budget is funded through a combination of Medicaid and the state, which traditionally supports such organizations, explains Cullins. Oregon lawmakers, trying to shore up budget shortfalls, cut PC’s funding by 6% in 2010, translating to a loss of $72,000. 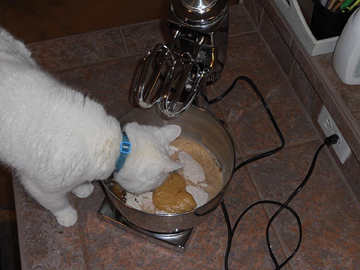 Writer Jake Faris tested the recipe with helpful assistance from wife Charity, and pets Angel (shown), Buddy, Lucy, Pearl and QuincyWhile this might not count for much to larger organizations, every penny at PC matters. According to Bekah Cardwell, PC’s Executive Director, they’ve already had to cut three positions and eliminate a portion of employee benefits. And, Cardwell says, to maintain its goal of providing transportation for participants, the organization anticipates having to replace its three vans in the near future. But, like other creative and diverse communities, PC is looking for ways to capitalize on their gifts. As visitors tour PC’s various activity areas (sewing, knitting, gardening, weaving, painting, the list goes on), the feeling is one of a large, warm family. The feeling carries through to the spirit in which the caring PC staff seek new production projects. Already providing janitorial services, job development/placement and ongoing contract work for Aramark uniform services, PC is always seeking ways to diversify its production activities. As Cullins points out, not only does diversification better cushion a lean budget, but the more work PC can generate in-house, the greater the possibilities for jobs for its participants. That’s why, when Kandi Kaiser, PC’s Direct Care Manager, approached Cullins about an idea for a pet-themed gift product, Cullins’s ears perked up. Kaiser had seen packaged dog treat mixes at a holiday bazaar she had attended. Like cake mix, consumers need only add “wet” ingredients and bake. For added appeal, the PC packaging includes a bone-shaped cookie cutter. To Cullins, this seemed perfect for PC. By February, Cullins had formulated the recipe, packaging, and cookie cutter into a production plan. Michelle Lewis, PC staff, supervised production, where eight participants at a time produced 15 bags of treats per day. In just two months, participants like Tommie B. had produced months’ worth of inventory. Asked if he had a production specialty, Tommie explains that while he did all the jobs, “The labeling was pretty cool. I got them on perfect.” There are other fans of the treat mix around PC. Kaiser, who had the inspiration, baked a batch at home for her dogs, Maggie 14, and Lucy 4. “They liked them!” Kaiser says with pride. The pride and gifts evident in the dog treats are just the tip of the iceberg. Across the street PC workers converted an acre of former blackberries into a working urban farm. PC participants grow just about anything suited to the climate, to sell at local produce markets. Compost and fertilizer is provided by chickens and goats on the farm, which are also tended to by participants. And Jeff, Buckaroo and Abby aren’t just any goats. PC sheers them twice a year, turning their hair into wool for their Fiber Arts program. Bonnie D., a weaver in the fiber arts program, demonstrated how she takes yarn and weaves it into a scarf she will later sell at Port City’s newly-opened gallery. Like the gold thread shot through her wool, personal pride and blessings are woven through every product, service and, yes, even dog treat, made at Port City. You can support PC by stopping by their new art & craft gallery at the corner of N. Williams Ave. and Thompson St. in Portland. Or, grab some tasty waffles and coffee just a block south at Solar Waffle Works and Coffee King. In addition to Pearl District Whole Foods, Waggin Tails Organic Dog Biscuits are also available online at PortCityDevelopment.org, TheCornerStore.com, Food Front (NW Thurman) and Green Dog Pet Supply. Jake Faris is a freelance writer who's worn many different hats, including a hardhat and the 8-point hat of a police officer. Jake and his wife Charity live with their three cats and four dogs in Beaverton. The whole pack moved to Portland from Wenatchee, Washington, years ago. Now a dedicated Oregonian, Jake finds new reasons to love his adopted state very day. Contact him here. Posted in Pet Biz and tagged with Treats. January 1, 2011 by Jake Faris - Spot Magazine.